"This was my grandma's most coveted recipe and we had it every time we went there. 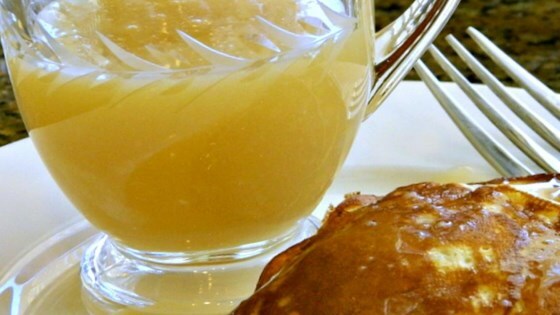 This is always a special treat and French toast with this syrup is one of my favorite breakfasts!" Heat sugar, buttermilk, and butter in a saucepan over medium heat until mixture starts to boil, about 5 minutes. Remove saucepan from heat and stir baking soda and vanilla into buttermilk mixture. Discover the secrets to buttermilk’s success in baking, marinating, and more. Make sure your pan is big enough as the syrup will foam up. Also, make sure you make this right before you plan on serving it because the foam will slowly disappear and that is the best part of the syrup. My husband & I loved this syrup on french toast.It tasted like warm melted vanilla ice cream,yum! !